A delicate 14K white gold filigree frames the sunburst engraved crystal at the center of this lovely antique style necklace. A fine faceted diamond is set into the center of the oval crystal. 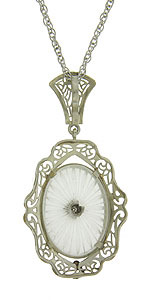 A delicate fan shaped hook dangles from the pendant. 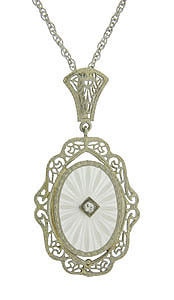 The pendant measures 1 3/4" long, 3/4" wide. The necklace measures 16" in length.